It is an exciting spring for me for many different reasons! This morning I learned that my article Scent of Cities: Kiev has been recognized with a FiFi award for Editorial Excellence. It was a very personal article for me—I wrote it thinking about my childhood city, and as I prepare to return to Ukraine next week after 4 years of absence, this recognition holds a special significance for me. I also want to congratulate all perfume bloggers, because the Editorial Excellence in Blog category is an important gesture of appreciation on the part of The Fragrance Foundation for our work. It is wonderful to be a part of such a diverse and interesting group. As I consider the season and the scents that make the spring of 2009 special, a few favorites stand out immediately. My list below (in alphabetical order) reflects my preferences this spring. The elusive nature of fragrance lends itself to many associations—colors, tastes, shapes, movements. Which descriptive phrase is more appropriate depends on the fragrance itself. In case of Homage, I think of fabric—soft hand loomed silk (given its suave musky base) decorated with the gold thread (rose and jasmine.) Since it appears in every single one of my seasonal lists, I suppose that it is simply a favorite. That being said, it works wonderfully on these cold spring days. In every Isabelle Doyen’s creation for Annick Goutal, I see an interesting contrast between modern tendency to minimalism and layered, multifaceted of classical perfumery. Matin d’Orage is not an exception—it weaves the white floral notes in an opulent tapestry, however instead of resulting in a heavy indolic bouquet, the composition is luminous and airy. I wore Matin d’Orage to celebrate Orthodox Easter, finding it an ideal fragrance for this uplifting and joyous holiday. I am slowly coming to conclusion that whatever the rendition of Vent Vert I wear (vintage, Calice Becker’s reformulation, Nathalie Feisthauer’s rendition,) the fragrance has such a strong character that no change can take away from its exhilarating verdancy and confident presence. It is the scent of bitter greens of spring, of wet earth and of first days of sunshine. Beige was not an instant love for me. Perhaps, I expected something different, I do not remember why it did not capture me the first time I tried it. I set it aside and forgot about it until one day I spilled the sample by accident and had no choice but to reconsider my initial opinion. Beige is a perfect name for this layered iris and gardenia composition. The ordinarily cool and earthy iris takes on an unexpectedly sensual warmth in this fragrance, while the white petals of gardenia, frangipani and jasmine provide an opulent accent. As I commented to Denise of Grain de Musc recently, I would be perfected happy with the current version of Miss Dior if it were marketed as something other than Miss Dior. It simply lacks the strong green-leathery character of the original that was both shocking and appealing. Otherwise, it is an elegant green chypre with a delicately rendered green note. I have been wearing it throughout this spring and enjoying its vintage inflection and understated charm. A quintessentially Jean-Claude Ellena wistful haiku describing what happens to vanilla when the creator begins to search for its orchid roots. Vanille Galante is a sweet, woody vanilla note reinvented through the petally dewiness of lilies. Absolutely fascinating scent that is worth trying simply to see vanilla in a different light. When it comes to Joy, I alternate between the golden opulence of the parfum extrait and the sheer green jasmine of the EDT. If you enjoy the luminosity and indolic headiness of classical jasmine, Joy is unrivaled. On the technical level, it is not particularly impressive—it is a perfumery equivalent of a dish with huge quantities of foie gras and caviar (and how can it really be all that bad!) However, experience the beauty of Joy’s jasmine and rose, and you will understand why great quality natural ingredients are so crucial to the art of perfumery. For that reason alone it deserves its legendary status. Fleur de Liane is reminiscent of green, sharper Chanel Cristalle, which for me is a good thing. Cristalle is a gorgeous chypre rendered with the classical Chanel elegance and subtlety. Fleur de Liane pushes it further, embracing the bitterness of its green notes. Anchored by the patchouli, woods and incense, this L’Artisan is a vibrant, exuberant composition. I also see it as an ideal scent for a hot summer day. My Easter gift this year was a discovery of a beautiful pine forest right behind my house. It has small creeks in which turtles sun themselves, wildflower covered glades and deer hoof marked trails. For all of its abstraction, Bois de Violette is not far from painting a picture of this magical forest. Its radiant spicy violet is one moment away from turning into the dark, incense-inflected wood. One of my most vivid olfactive memories of India was that of a small bouquet of champaca flowers left in the small shrine of my friend’s house. The apricot and jasmine fragrance was vivid and clear as first, but as the day grew and the sun weathered the petals, the aroma became fleshy, animalic and almost indecently sensual. The last few gasps that the flowers gave out were of dried peaches and leather. In a word, Tom Ford’s Champaca Absolute is not far from recreating this wilting champaca offering. Amazing! For more Top 10 of Spring choices, please see Grain de Musc :: Now Smell This :: Perfume Posse :: Perfume Smellin’ Things. Note about Comments: Due to a minor tech issue, which I am in the process of fixing, the comments appear as follows: Any comment above 100 will appear on Comment Page 2. Any comment over 200, will appear on Comment Page 3. So, if you do not see either your comment or my reply, please click on the links above. Sorry for the confusion! 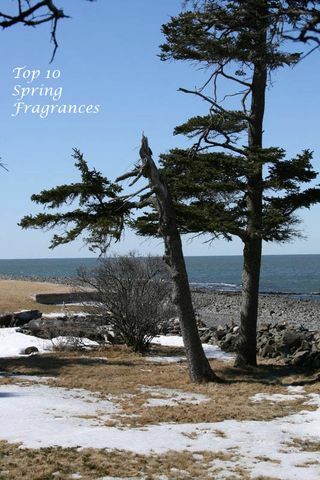 Photo of Nova Scotia beach in the spring © Bois de Jasmin. Update: The draw is now closed. I assigned a number to every participant and used a random number generator to select one winning number. The winner is Agritty. Please send me your address. Congratulations on your award! You deserve it. I’m glad you’re back to posting! MarkD: Congratulations! I liked that article. 🙂 No need to enter me into the draw, unless it is for the vintage Vent Vert (HA!). Lavanya: Congratulations, Victoria!! (I usually lurk here..:))..I’ve also been enjoying my sample of champaca absolute..Everybody seems to be raving about VG. Must try it soon! Would love to be entered in the draw!! Thanks! Lavanya: I’ve sort of felt that connection (that you have) from a couple of your reviews (I don’t remember which review- it had a few descriptions of your visit/one of your visits, related to weddings and sandalwood/saffron)..That is so cool that you are planning your wedding there-(if you don’t mind my asking) where in India is the wedding? Oh- and that is good to know about VG- will definitely try it!! Isa: Congratulations on your wedding and your award, Victoria! I love to read you’re having a wonderful springtime. Jemi: Best wishes on your engagement, and congratulations on your award. The award is well-deserved. divinemama: V, many of my favorite scents are on your list. Please enter me in the draw. I loved your piece on Kiev. I am so glad you received some deserved recognition for it. I read it over more than once. I long to travel. Reading about other parts of the world helps fill that desire. KathyT: Congratulations on all of your good news! I would love to be entered into the drawing. I’d love to be added to the prize draw! violetnoir: Wonderful, wonderful news, dearest V! Best wishes on your engagement and on the FiFi Award. You deserve every happiness in your personal and professional life, so I am thrilled for you! I love your list and have many of these fragrances. But, I don’t have all of them, so please enter me in the drawing. Bois de Jasmin: Molly, thank you very much. I will try to do my best to post as frequently as possible. Juliet: Victoria, congratulations on your engagement! I wish you and your fiance much joy. And congratulations also on your award–I just read the article and enjoyed the way you evoked a place I’ve never been but would love to visit someday. While we wait for the reviews of your top 10, I am taking the liberty of entering myself in the draw for Bois de Violette, which I have never tried, would you believe 😉 Like I said at PST, my springtime scent of choice is a green violet, Eau de Cartier, but I also find myself reaching for Bel Respiro, Kelly Calèche in both concentrations, Egoïste and Déclaration, to name a few. Bois de Jasmin: Lavanya, you know, I feel that India is my other motherland, I feel so much connection to it. Actually, my other article in the city series is about Mumbai. I am just not able to get around to it, because I want to include photos, and it takes ages to format them. Congratulations on your engagement and your award! I’m happy you’re back in the blogosphere–reading your old posts has been quite an education for me. carmencanada: I’ve already congratulated you on the personal big event, so congratulations on the public one! I am glad you are posting again! Great choice of Spring fragrances. Felicitations ! I couldn’t be happier for you – on your engagement (so who is the most lucky man?) and also on your Fifi ! This is the Spring of your contentment. May it continue to be so. You have created and perfected the art of perfume writing . I will look up your article on your eloved home city. Also the ancestral city of my father’s relatives. Please enter me in the draw ! I mourn for what was the most stunning Miss Dior and even Diorissimo – alasthey have been altered. I am anxious to try VG and TF – Champaca . Yes what are your thoughts on possible wedding scents ? k-amber: I am so happy for you! I bought Vanille Gulante 15×4, which is like a pleasant spring breeze. I can’t wait for your reviews. Enjoy your stay in Kiev. All our reminisces about what started four years ago – aren’t the harvests beautiful? I can’t find enough words to congratulate you and I only see more wonderful recognition for your finely-honed sensibilities in the future. sweetlife: Ah, there’s your post! First of all — mazel tov twice over! I remember that article well. Let me know if you need any tips on how to remain sane while planning and participating in your own wedding as a grown-up with other things to do. Trish: No need to enter me Victoria, just wanted to wish you all the best and much joy in planning your wedding!! Maryla: Congratulations on your engagement and the Fifi Award! Mindy: My heartfelt congratulations! I am anxious to read more from you on your happy event and your perfume musings. Please enter me for the drawing. ambreroux: Wow! I’m so glad for you! And woderful choices: I would have trouble choosing! EileenS: Best wishes and congratulations! You’ve had some wonderful events come to pass, both well-deserved. Your spring Top 10 is an interesting mix — I’ll have to try some of these, now that you’ve brought them to my attention with your lovely descriptions. I’ve been wearing a selection of green scents recently, among them Jacomo Silences and the current version of Vent Vert. It will take me a while to get to the late spring florals. Safran: Congratulations to your engagement and the prize, Victoria, I am happy for you ! And please enter me in the draw as well. Lavanya: V- So I went to the Hermes boutique to try Vanille Galante and came out thinking of Poivre Samarcande and Ambre Naguile..I had forgotten that I hadn’t sniffed any from the Hermessence collection. Bois de Jasmin: Dusanchik, thank you so much for your kind words! Eau de Cartier is a wonderful fragrance, its yuzu note paired with violets is such perfection. All in all, I love the fragrances on your list. Like I said to March, I am kicking myself for forgetting Bel Respiro. Bois de Jasmin: Gangel, thank you. Bois de Jasmin: Stephanie, thank you. every time I read your blog, I am transported from my day, my keyboard, my thoughts – to the world of scent. The surprises of new scents I would never know about, in tandem with your passion for fragrance and writer’s gift is a bouquet in and of itself. Bois de Jasmin: Snowcrocus, Bois de Violette is a wonderful fragrance, perfect for spring. Bois de Jasmin: D, thank you! I loved your list too, which is not surprising since we have always shared many favorites. Bois de Jasmin: Jemi, thank you! Bois de Jasmin: Divinemama, thank you. I am glad that you enjoyed my Kiev piece, which was one of my own favorites. Thinking of a place where you were born is such a bittersweet exercise, isn’t it? Karen G: Congratulations on your engagement, and on the award! Can’t wait to hear more on which scent you might choose for the wedding. I would love to be entered in the draw because I adore “green” fragrances. Lavinia: Congratulations on the engagement! I’m still in the search phase, so I know how wonderful it must be, when you find someone who fully appreciates you and you feel the same way about him. Eric: This is my first comment on your wonderful blog, though I frequent your archives often to get your point of view. I never really caught you during a frequent-posting phase and so I’m delighted you’re back. I’ll be up front. I generally abstain from draws, especially when I haven’t commented on the blog before (which includes most of the good ones). However, I have been dying to try Homage and haven’t put it on a sample order yet (I’ve been swamped by a recent exploration through Guerlain, spurred by an instant love with Mitsouko). So yes, I would like to be entered in your draw. I would completely understand if you chose not to enter me, though. Kess: Congratulations on the award! Anya’s Garden Perfumes: How did I manage to skim the first paragraph and miss the engagement announcement?! So belatedly, many many well wishes from me – I’m so happy for you. Are you going to blend your own wedding perfume? If so, maybe I can contribute some very rare tinctures I’ve made, like the jasmine sambac that is sooo soft and sweet, the Grand Duke which is quite bawdy, the Michelia alba, totally narcotic, or the Vietnamese gardenia, which I’ve just started. I also have dracena fragrans, night-blooming jasmine, orange jasmine and some others I’ve forgotten right now in my excitement! Roland: Congratulations on your award and on your engagement! DianaWR: Congrats on your engagement and award! Eleven European Mystics: What a lovely selection. I’d like to be counted in for the draw. Please enter me in the draw: a couple of those fragrances are big lemmings!! Attarine: Congratulations for your engagement! I wish you alla the best. ScentRed: Congratulations and please enter my name in the draw. I’ve been liberally spritzing Annick Goutal Chevrefeuille in the hopes it will encourage Spring along. Marian Bendeth: Congratulations dear Victoria! May more fragrant dreams be realized! Congratulations on your Fifi but more importantly your engagement. To have an engagement tied to spring makes it so much sweeter. Now you must be on the hunt for the perfect wedding scent, and I do hope you’ll keep us informed of the contenders. I love the list and it seems Balmain Vent vert is just the thing I’m looking for this spring, I will have to try it. Nancy: Accolades to you on the Fifi Award!! It comes as no surprise to me — Bois de Jasmin is such a well received blog on scent. Most important, warm wishes on your forthcoming nuptials. Bois de Jasmin: Borhane, thank you for your kind words! I am so glad that the articles are interesting to others, as I certainly enjoyed writing them. Bois de Jasmin: Anne, I adore lists too! It is fun to reflect on one’s favorites of the moment. Bois de Jasmin: Natalie, I’ve entered your name! Bois de Jasmin: Janet in CA, I’ve entered your name. Bois de Jasmin: ooofireballooo, done! Bois de Jasmin: Juliet, thank you and welcome! I hope that you are able to visit Kiev, it is definitely a place with lots of interesting things to see. Eastern Europe in general is quite fascinating given its history. I myself would love to travel more through Russia, since I am only familiar with Moscow and Saint-Petersburg. Bois de Jasmin: Charlotte_V, thank you! I am very excited about my trip and about seeing my grandmother again. Bois de Jasmin: Kaori, I like how you defined it, a pleasant spring breeze. It is just that! Bois de Jasmin: Janet, it is truly the season. I also had a couple of weddings to attend. Bois de Jasmin: Arwen, thank you! Spring fragrance lists are my favorites, I think, because it is the best season to enjoy scents, especially the first fragrances of nature itself. Bois de Jasmin: Alyssa, thank you, thank you! I think that I definitely need tips, sanity is something that is easy to lose when planning any wedding. In our case, it will be even more so, as our families combined number in hundreds rather than dozens. 🙂 However, everyone is excited and planning their trip. Bois de Jasmin: Madelyn54, thank you for your kind words. 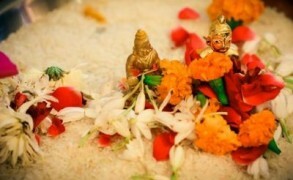 I have been thinking that Champaca Absolute would make a wonderful wedding scent. I wanted something jasmine or white floral, but not overly heady, as it will be warm then. Bois de Jasmin: Nattygold, thank you, I am glad to be back too. One realizes how wonderful are interactions like these. I missed them too. Bois de Jasmin: Maryla, thank you very much. Klara: Congratulations on the engagement and the award! Laura: V! At last??? Congratulations from my heart to both of you! This is such wonderful news! Bois de Jasmin: Justine, thank you, I’ve entered your name. Bois de Jasmin: Connie, thank you, it is an exciting spring, even if a bit hectic. I will try to tell more about the wedding planning and scents. Bois de Jasmin: Safran, thank you, nice to see you here. Bois de Jasmin: ElizabethAK, thank you! I realize that most of the perfumes have been changed since their births, but these days, when so many are simply discontinued, I am starting to appreciate those that are still on the shelves. Even if they are very different from what they used to be. Bois de Jasmin: Roland, thank you! Bois de Jasmin: Eric, I can definitely see how Vanille Galante can veer in the direction of a candle, it is a note away from that vanillic-floral accord. What saves it for me is the marine note that lightens up the whole effect. If I were to pick between Vanille Galante and Matin d’Orage, I would pick Matin d’Orage without doubt. It has that natural petally quality I adore in the Annick Goutal florals. Bois de Jasmin: Carter, thank you! Bandit is such a genius fragrance that I find it suitable for almost anytime and any occasion. I like even the tweaked version. Of course, it has so much character that it is impossible to deprive Bandit of its signature. Bois de Jasmin: ScentRed, I myself have been wearing Annick Goutal Le Chevrefeuille often, especially last year. I probably almost finished a bottle of it, which is unusual for me. Bois de Jasmin: Lisa D, thank you. I also love making the lists and reading those of others. They are a lot of fun, and one discovers something new this way. Bois de Jasmin: Melissa, definitely try the new version of Miss Dior. It is different from the original, but I find it beautiful anyway. Bois de Jasmin: Ines, Vent Vert is gorgeous, new and old! Bois de Jasmin: Nancy, thank you so much.